If you had put a People Magazine, US Magazine, Newsweek, or any home design magazine in front of me, I would always choose the home design magazine. As I mentioned in my last blog, I love home decorating! So much so, that I used to draw most of my decorating ideas from pictures I saw in those magazines. I was more interested in my home looking like a picture from a Pottery Barn magazine than what my home said about me and my family. I’ve grown a little! In my new house, I have completely re-prioritized! My husband and I sat down and discussed what we wanted the decorating of our new home to say about us. We decided that we want it to speak about the beauty of our faith and our family. Displaying your faith in your home can be a challenge. I have far more faith pictures and items that I have collected over the years than I have room for in my home. I decided that not everything needs to be hung or set on a table, but rather things that fit well in the house and also demonstrate our goals. Here is the entry area of my home which is one of the first things people see. I love this “Our Father” piece made out of wood that a friend gifted to me. Under it, I stacked some small old Bibles. Matter of fact, they were my grandmother’s, so they carry extra-special meaning. 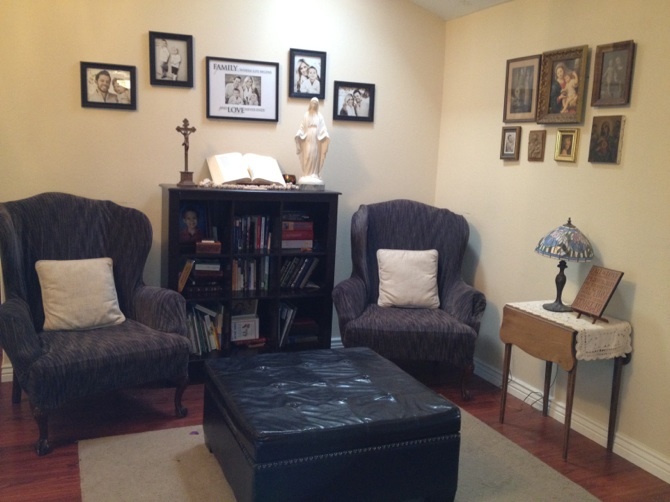 When you enter further into my house you can’t miss our prayer area. 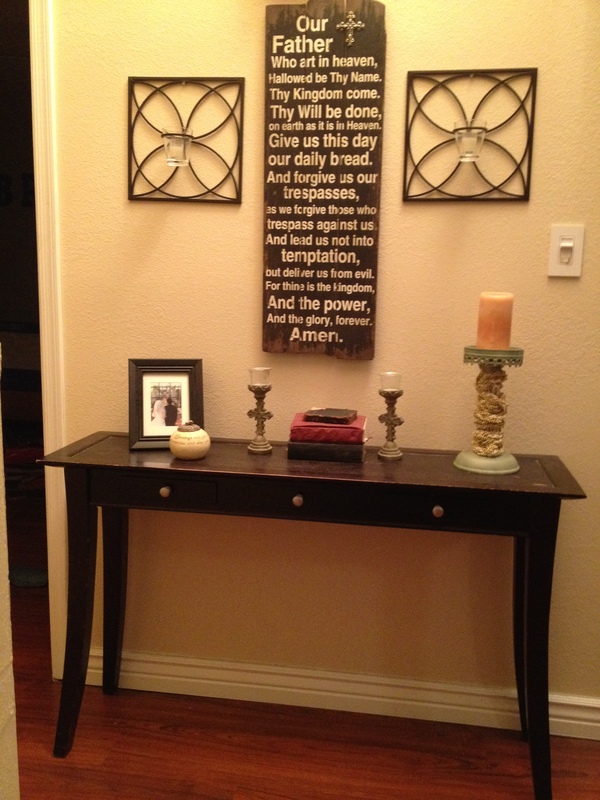 The first priority we made in arranging furniture in our new home was committing to having a prayer area. Because our house has no spare bedrooms, we decided to use space in the out and open area to create our family prayer space. 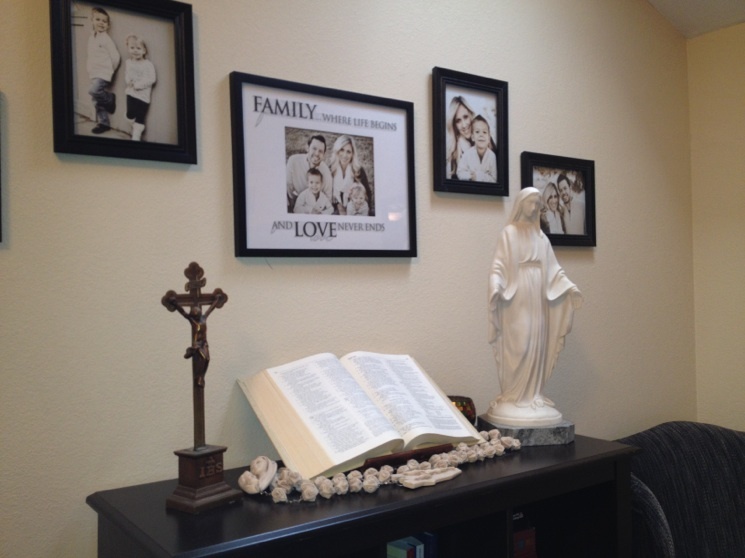 It blends our family pictures with our faith images. In addition, the bookshelf contains our favorite books that enrich our faith and we often find ourselves in study sitting on the wingback chairs. Matter of fact, this is where I am writing this blog. It is a quiet, peaceful place in the midst of our loud home! Here is a close up of the focal point of this space and it can be seen from most of the house as well. This is our favorite place! On the other wall we displayed our religious art. We want our kids to grow up surrounded by the beauty of the Church. 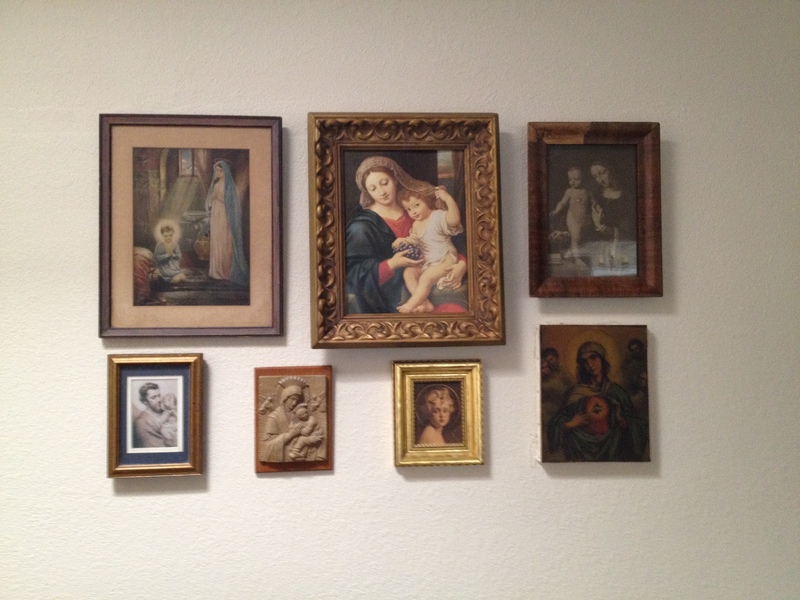 Here is a tip on arranging religious art. If you have a lot of art but feel hanging them all over the house will be too overwhelming for your family, find one area where you can hang many pieces but make it seem like it is all one piece. I arranged the above seven pictures in the shape of a rectangle to achieve the unity I was going for. Not only do I love the antique look of them all, but these pictures mean something to me. Most were given to me by my grandmothers and my mother. They are faith items handed down and when I see them, I feel a sense of honor. 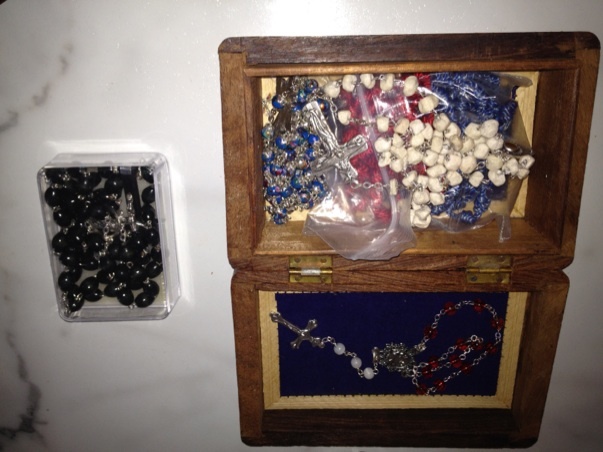 In our prayer area, there is our family rosary box and next to it is my 5-year-old son’s rosary in its own box. On Brady’s fifth birthday, Doug took him on a special trip to the Catholic bookstore where Brady was able to pick out his own rosary. We keep it separate so he knows how special it is. Since his birthday, we have been doing a decade of the rosary before bed. We all kneel around the console table and Doug and I say the first half of the “Hail Mary” and Brady says the second half. We let him do it so he takes ownership and it keeps his focus. At the end, we signal to Ella (2 and a half) who has made it her job to lead the singing of the “Ave Maria.” Then Brady concludes by saying, “And all God’s people say” and we all yell at the top of our lungs, “AMEN!” Then I say, “A family that prays together” and they finish “stays together.” It truly is the most special time of our day. We love that we have created this space in our home to pray together regularly! 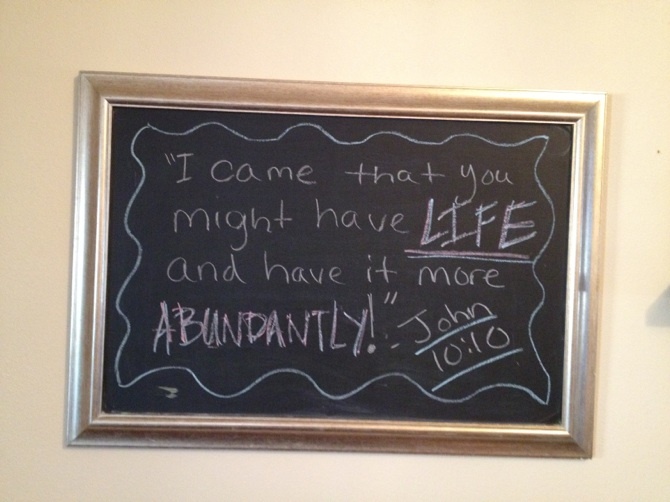 My other favorite self-expressive piece in our home is our framed chalkboard that sits above the dining room table. Every week, we write a new scripture on it and contemplate it. What I love about the chalkboard is that it makes our home personal. When people come to visit, we write welcome notes on it. When it is someone’s birthday, we decorate it. It’s always an attention getter! I am also a big fan of signs that speak! 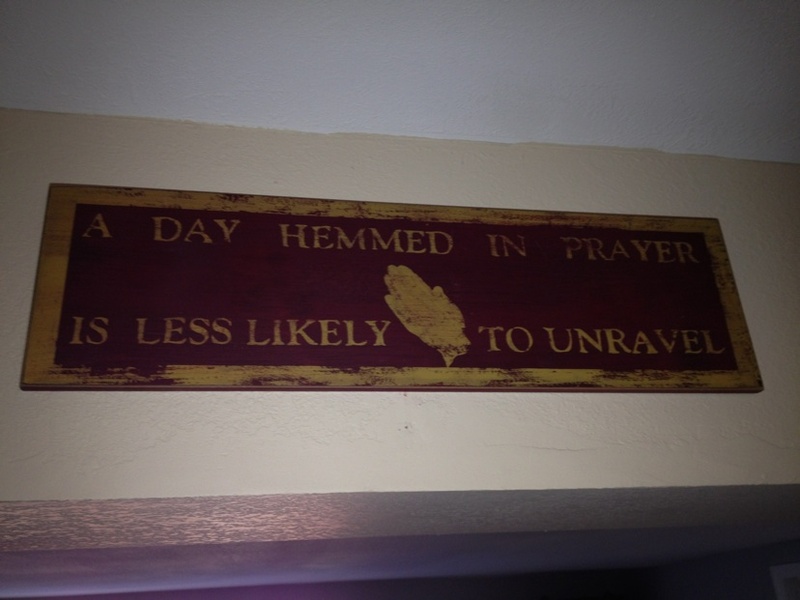 Like this sign above the entryway to the living room. 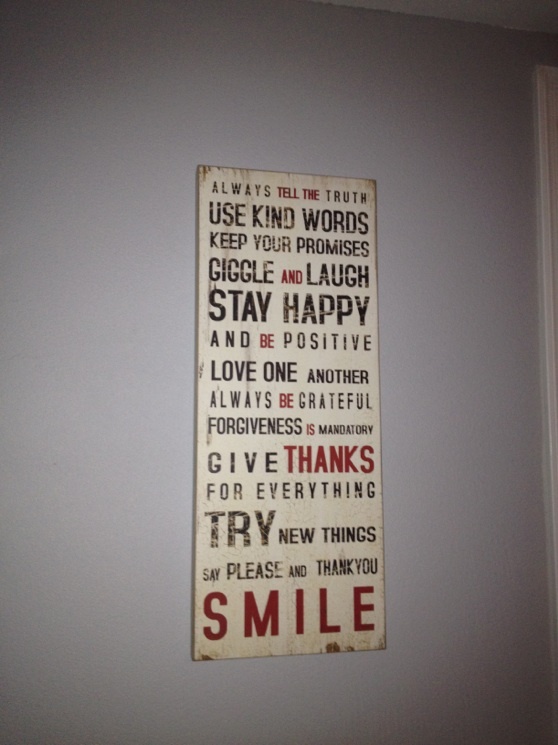 Here is another favorite that has some house rules posted in a creative, rustic way. This sign and the “Our Father” wood sign were bought at Hobby Lobby which is a great place for original pieces because they don’t stock too many of one design! Also, Hobby Lobby has taken a stand not to obey the government mandate that would force them to provide contraception and abortifacients to their employees through insurance. To support their courage, I now frequent their store where I have found a lot of other great decor! These are the things that make our house a home! Hope you enjoyed this peek into my decorating style! I would love to hear special ways you decorate your house to make it your home. Leave us your decor tips in the comments especially if you have ways to display your faith in creatively! Note: Sorry if the pictures aren’t great; I took them on my iPhone! I love the Pottery Barn look too. I like how you’ve managed to throw in a liltle bit of “catholic” into the mix! P.S. thanks so much for the added info on the rustoleum post! It was so nice of you to take the time to respond to my questions! I don’t know when we’ll get around to it, but it looks like the way to go…but first my husband and I have to agree on a color. I think we need two kitchens because we just can’t seem to share the one we have. How beautifully you have done all of that, and integrating it all into your prayer life is really great! Very nice post, and a nice job of Catholic decorating of your domestic church! Thank you for sharing you decorating tips. Incorporating your faith is such a wonderful way to witness to others. I believe your children will be so blessed and it will impact their lives in so many ways. I don’t know if you remember me but I was your sister in laws nurse when she delivered her babies. I met you when you came to visit her. You shared your story with me and it impacted my life tremendously. I have shared your story with others and have given several friends and family your book. I feel blessed have met you and your family. Take care and may the Lord continue to bless you on your journey. ← I’m a “DIY” Kind of Girl!